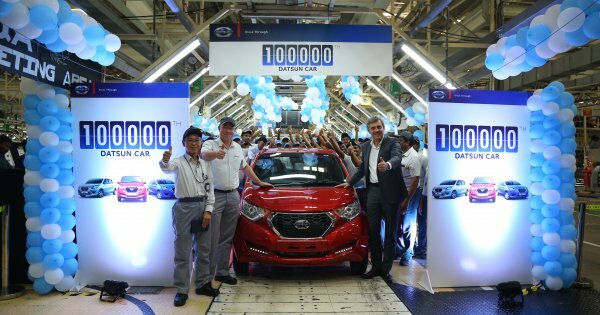 Datsun India celebrated the production milestone of its 100,000th car as the company rolled out a redi-GO 1.0L at its manufacturing facility in Chennai. Jerome Saigot, Managing Director, Nissan Motor India Pvt. Ltd. said, “The 100,000th roll out of Datsun is a strong testimony of customer acceptance and their confidence towards our brand, products and value based offerings. On behalf of the Datsun India team I would like to thank all our customers and dealer partners for the commitment towards our brand”. Over the last 3 years, the customer response to Datsun portfolio which includes the GO, GO+ and redi-GO has been incredible. Datsun today accounts for more than half of the total sales of Nissan Motor in India and continues to steadily growing as stated by the company in its press statement. The Datsun redi-GO showcases a Japanese design philosophy called YUKAN – which stands for brave and bold. It features ‘Tall-Boy’ styling and offers best-in-class ground clearance of 185 mm, extra roominess and excellent external visibility for the driver. Datsun redi-GO comes with a comprehensive safety package –Datsun PRO-SAFE7. Since the launch of the Datsun redi-GO in June 2016, Datsun India has offered three refreshed variants for its customers- the redi-GO SPORT in September 2016, the redi-GO 1.0L in July 2017 and the recently launched redi-GO 1.0L GOLD in October 2017 has received an overwhelming response as claimed by the company. Datsun redi-GO customers can also avail of the “Datsun CARE” comprehensive service package. Datsun CARE is an industry-leading all-inclusive car service package that offers peace of mind to customers. “We are very confident that the future is bright and exciting for the Datsun brand in India. We are confident that our challenger brand positioning, unique product differentiation and best in class cost of ownership will continue to drive the customer’s owning and experiencing our products”, added Jerome Saigot, Managing Director, Nissan Motor India Pvt. Ltd.